In manufacturing and quality control across all industries, accurate color is important. When color does not meet specifications, the result is increased cost and time to market, with more rejects and rework. That’s why it is important to view color under controlled lighting conditions. 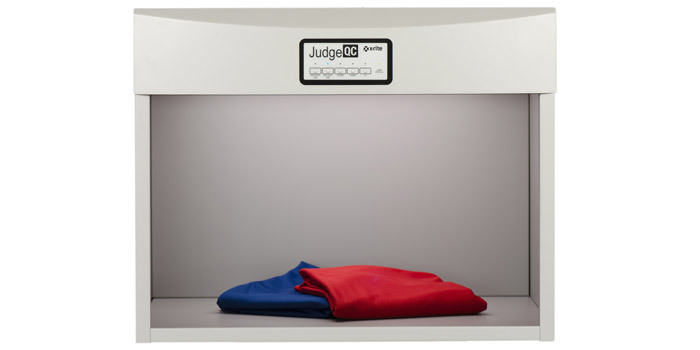 Integrating the Judge QC light booth into a color-critical workflow improves quality control and delivers a rapid ROI. The X-Rite Judge QC is the industry’s most cost effective light booth featuring a robust industrial design. Its metal construction with a powder-coated surface is built for longevity. Its five light sources deliver consistent fluorescent illumination that complies with major international standards, including ISO, ASTM, DIN, ANSI and BSI visual assessment requirements. It has a dedicated D50 light source for print & packaging; a dedicated D65 light source for industrial applications, and a Dual Daylight mode for easy switching between light sources in situations where operators may need to view samples under both lighting conditions. The X-Rite Judge QC light booth offers an economical and effective way to judge color, anywhere color quality needs to be evaluated. Achieve better color evaluation of incoming materials with consistent lighting. Benefit from robust, industrial construction that will serve you for years to come. Always know exactly how functional the Judge QC lamps are with its convenient lamp service indicator. Take advantage of multiple options for lamp replacement, designed to be as convenient as possible and ensure maximum up-time. Check for metamerism a phenomenon that occurs when objects match in one light source but not in another. The Judge QC comes fully equipped with a UVA lamp for accurate evaluation when samples contain optical brightening agents (OBAs). OBAs are used to achieve a “whiter-than-white” effect on a range of materials, including plastics, paints and coatings and paper.